When it comes to marketing and promotion, every tool is an opportunity to enhance the business. No matter how much digitally acquainted we are, there are certain things which will always involve paperwork such as business cards, letterhead, notes and many more. It’s extremely important for a marketer or a presenter to pull all his loose papers together and keep them handy to pull it off whenever necessary. Pocket folder printing is the best option for keeping the documents in a classy and elegant way. We provide Pocket Folder Printing in Delhi & NCR. Presentation folder is extremely effective yet elegant to make the first impression. It not only sparkles interest and adds professionalism to your presentation, but it also grabs the eyeballs of your prospects which makes your half job done. We at Print2Ads, provide one of the finest quality pocket folders in the most affordable price to add extra feather in your business cap. 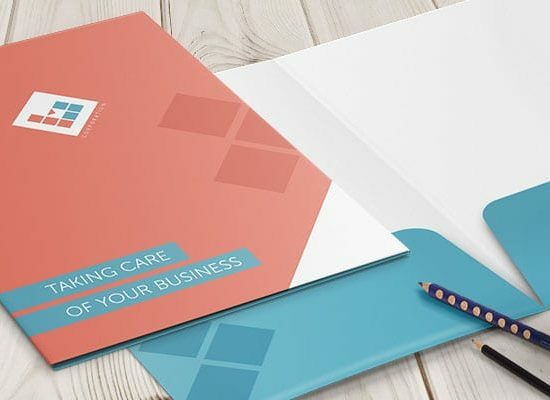 With our high-end, customized pocket folders, you can reach out more effectively to your target audience, prospects or industries in an attractive way which will enable you stand apart from your competitions. We at Print2Ads, have marked our prominence in the market with our high quality pocket folder printing services. Being in the business for quite a long time and serving prominent clients across all verticals, we understand the criticality of apt marketing. We use the best materials to exceed our customers’ expectation. Our comprehensive pocket folder catalogs will give you the best match for every occasion. With 48 hours turnaround time assurance, you can rely on us and focus on your core business activities while we take care of the rest to propel your business and help you make a lasting impressions on your prospects.